For a recent dinner party with a group of food-loving friends, I was asked to bring the appetizer. The stakes were high: My friend, Lou, was making lobster mac and cheese for the main course and my friend, Carrie, was making a Thomas Keller gazpacho. 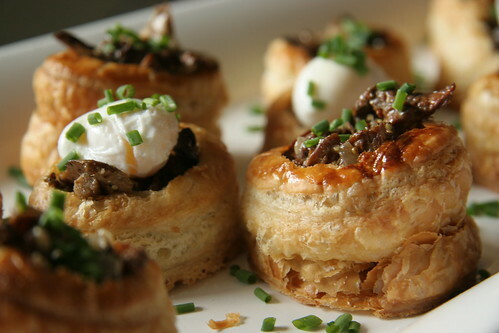 In researching all things that you could savor in one bite, I came across "vol-au-vents" and discovered that these little bite-size puff pastries were a catering classic. The only question was what to fill them with. I had found a promising recipe for a vol-au-vent with a three-mushroom filling in Joanne Harris and Fran Warde's "My French Kitchen." 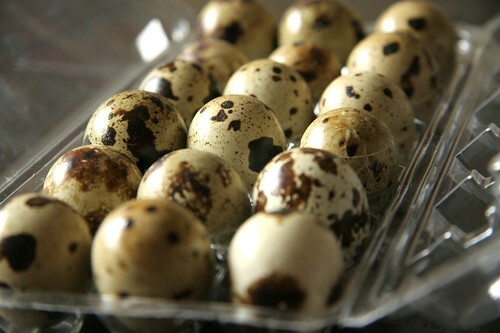 But I had also been spying the quail eggs at my supermarket. So I decided to combine the two and make a vol-au-vent 'madame' with mushroom and egg, and vol-au-vent 'monsieur' with just the mushroom. Harris and Warde's recipe includes chanterelles, which I have eliminated for the off season. I also substituted butter and armagnac for olive oil and cognac and cut the cream in half. Heat the butter in a skillet. Add the shallots and simmer for 30 seconds and then add the mushrooms. Cook over medium-high heat, stirring constantly until cooked down. Add the cream, mustard, armagnac, and salt and pepper and simmer for 5 minutes. Defrost one portion of frozen puff pastry. Preheat the oven to 425 degrees. Unfold the puff pastry on a cutting board. It should be about a 1/4 inch thick. Cut out 12 small rounds with a pastry cutter. Place them on a water-dampened baking sheet and return to the refrigerator to chill for 30 minutes. Take a cutter half the size of your first one and cut an indentation in the center of each pastry circle (cutting about halfway down, but not all the way through to the baking sheet). 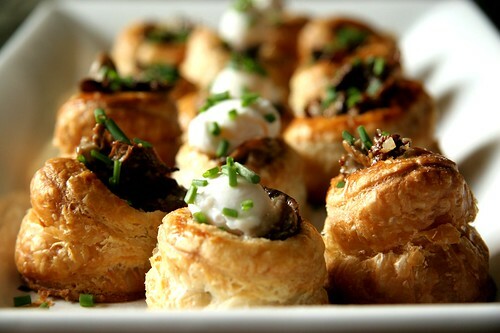 Take a small knife and push up the edges of the vol-au-vent shells to help the pastry to rise in crispy layers. Brush the top of each shell with the beaten egg, making sure none drips down the side or it will glue the layers together. Bake for 30 minutes. When the vol-au-vents are finished cooking, use a butter knife to pry off the 'lid.' Eat the lids as a snack while cooking or discard them. Fill the vol-au-vents with the stuffing of your choice. The trick to poaching quail egg is to break the shell without puncturing the yolk. The size of the egg makes that difficult. Professional chefs hold the egg in one hand and deliver a swift slice with a knife in the other hand -- just enough to puncture through the egg and the egg's protective inner lining without breaking the yolk. Once the shell's surface is sliced, pry the shell apart with your fingers and drop the yolk and whites into a bowl filled with white wine vinegar. When you're finished cracking all the eggs, pour the bowl of eggs and vinegar into boiling water and cook for about 30 seconds. 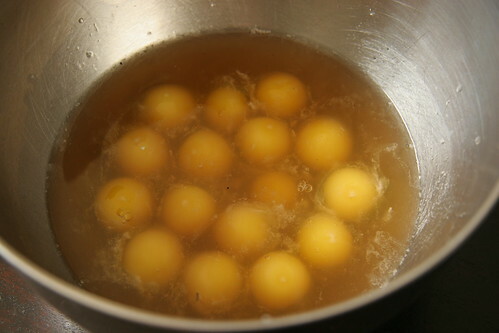 Remove the eggs and drop them into ice water. Fill the vol-au-vents first with the mushroom filling and then top half of them with egg. Sprinkle the eggs with salt. Garnish with the chives. Hey Ange -can I call you Ange? Thanks for your nice comments. I don't have any tips for design other than PAY someone else to do it! My designer was really pretty cheap and she did a great job, didn't she?! I am pleased with it. This looks SO good, and your photography is STUNNING per usual! These are the kind of appetizers that make me say "no thank you" when the entree comes. Oh wow. I am IN LOVE with these vol-au-vents. Seriously. IN LOVE. They're so gorgeous. And looks so delectable. Natalie: Please do call me Ange! Thanks for the tips about the web design... I was wondering how you did that all by yourself! Great idea to hire someone. Maybe one day I'll do thaqt. Thanks for visiting. I'm glad you like the photos! Thanks, Peter! That was pretty much the comment of the party host too. :) Though we happily wolfed down his amazing dinner. No sweat. Eating club: Thanks! Those photos did turn out nice. I'm glad you like the idea! 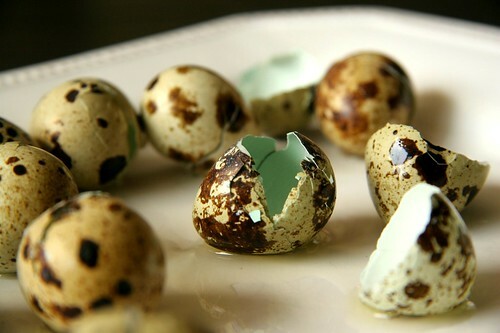 Fantastic idea with the quail eggs! Those looks super-scrumptious! Nice photography. Great looking vol au vents!! Thanks, norecipes! Poaching the quail eggs is a great way to 'take it up a notch' and really not that hard. Thanks, amritac! I'm glad you like the photography. It helps to have a photogenic dish! So elegant--well done! I am very impressed, and I love how you took a picture so we can see the insides of the beautiful egg shells! Thanks, Jaime! I love that shot too. The inside of the egg shell is gorgeous! I love your food blog -- what amazing photos you take! Thanks for visiting. what a beautiful way to start a meal! these look terrific and i'm sure they tasted amazing too. Thanks, Mimi! Introducing these to the guests was almost as fun as the eating!